Is that the sound of the Cyber Monday deals gong ringing? Why, yes is it, and with it the beep of a reversing truck full of even more gaming headset deals to replace the ones we had over Black Friday. There are some notable movers and shakers on today’s best Cyber Monday gaming headset deals sheet, such as newly refreshed prices for lots of Steelseries gaming headsets, as well as a couple of new entries. Hurry, though, as the window for picking up one of today’s best gaming headsets for less than normal is closing pretty damn fast. Whether you’re after an entry-level headset for under $50 / $50 or an all-singing wireless one for over a hundred, your deals herald has got all the best Cyber Monday headset deals right here. Let’s take a look. As always, you’ll find all these and more over in our central Black Friday and Cyber Monday 2018 hub, but just in case you clicked on this page by accident and actually want one of our other Black Friday and Cyber Monday deals hubs, then you’ll find everything you’re looking for in the links below. With so many headsets available these days, it can be hard to find one that’s right for you. After all, a gaming headset doesn’t just have to sound good, it’s also got to be comfortable to wear for long periods of time, and have a decent quality microphone if you’re going to be using it for playing with your mates online. With that in mind, here are some top tips for hunting down the best gaming headset for you and your budget. 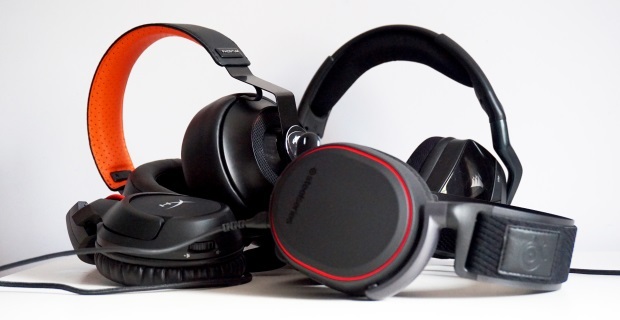 Gaming headsets largely fall into two broad categories: wired and wireless. The latter are usually more expensive and need regular charging, but come with the added bonus of being wire-free (as the name suggests), giving you one less thing to worry about in your warren of PC cables. Wired headsets, meanwhile, usually connect to your PC via USB or a 3.5mm audio connection, but USB ones are generally PC-only headsets. If you’re looking for something you can also use with a console or phone as well, I’d recommend a 3.5mm headset. Just make sure it comes with a headphone and microphone splitter or adapter (i.e: two separate jacks instead of a combined one) otherwise you won’t be able to use the microphone while playing on PC, as some headsets specifically designed for consoles don’t always come with them in the box. Be wary of headsets that say they do 7.1 surround sound. Not because 7.1 surround sound is a bad thing, but because not all 7.1 headsets are created equally. In order to do proper 7.1 surround sound, for instance, you need seven individual speakers and one subwoofer. Headsets, clearly, aren’t built for that, so most 7.1 headsets achieve their surround effect through software – what’s known as ‘virtual 7.1 surround sound.’ Again, this isn’t necessarily a bad thing, but it’s worth reading reviews to see how good a headset’s surround sound effect actually is, because some can be pretty terrible. Similarly, don’t get fooled by headsets that say they do Hi-Res audio, because that doesn’t necessarily mean they’re better than everything else. Hi-Res audio headsets are really intended for people who also have a large library of proper Hi-Res music files, or subscribe to Hi-Res streaming services such as Tidal. Most games don’t utilise Hi-Res audio, so they’re not going to make your games sound any better than your regular non Hi-Res headset. By all means go for it if you’re planning on using it for listening to regular Hi-Res music files as well, but I suspect that, if indeed you are such a person, you’ve probably got a much better pair of headphones for doing that than your average gaming headset.